At a truly glittering ceremony held at the Y.B. 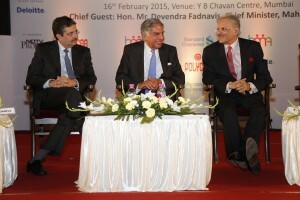 Chavan Centre in Mumbai, one saw the figures from India’s corporate arena getting honoured for their meritorious contribution to the global business environment at the recent 36th BMA Awards for Excellence ceremony. 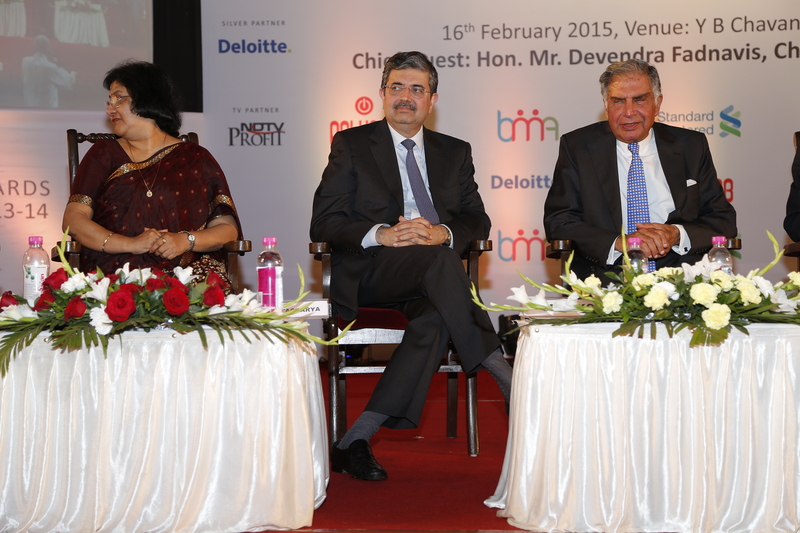 While the legendary Shri Ratan Tata, Chairman, TATA Trusts was honoured by the panel of Jury with the ‘BMA Diamond Jubilee Lifetime Achievement Award’, Shri Y C Deveshwar, Chairman, ITC, another leading corporate figure received the ‘Management Man of the Year’. 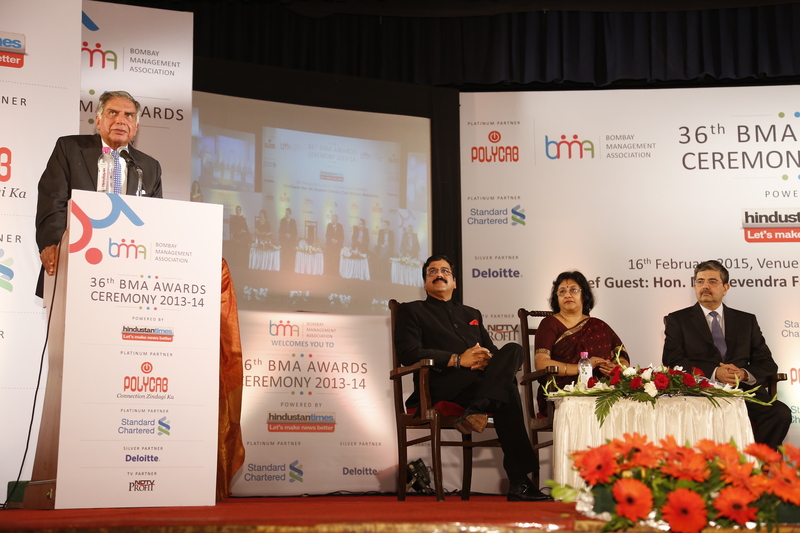 Smt Arundhati Bhattacharya, Chairperson, SBI, bagged the ‘Management Woman Achiever’, Shri. 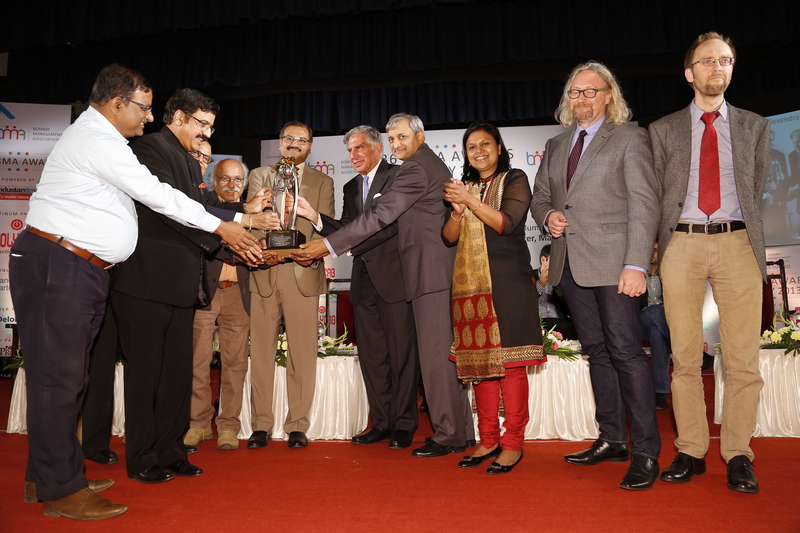 Uday Kotak, Executive Vice Chairman &MD, Kotak Mahindra Group received ‘Entrepreneur of the Decade’ and the young duo Shri Kunal Bahl and Rohit Bansal, Co-founders of Snapdeal, took home ‘Entrepreneur of the year’ award. In the academic awards category, Prin. L. N. Welingkar Institute of Management Development (WeSchool) was honored with the ‘Best Management Institute of the Year 2015 ‘ .While Prof Dr Uday Salunkhe, Group director, WeSchool accepted the award along with his team , two young faculty members adjudged as the ‘Best Management Faculty of the Year’- Prof Dr A A Attarwala, KBS and Prof Dr Swatee Sarangi, KJSIMR and the -Best Management Student of the Year’, -Mr Rohan Dhall, NMIMS were also felicitated at the hands of Shri Tata. WeSchool is previously honoured with the ‘BMA Outstanding Management Institute of the Year Award ‘in 2010 and 2013.While welcoming the august gathering, Shri Niteen Bhagwat, President, BMA said, “BMA cherishes its partnership with B Schools as it is through them we are able to establish good management practices and ethics. 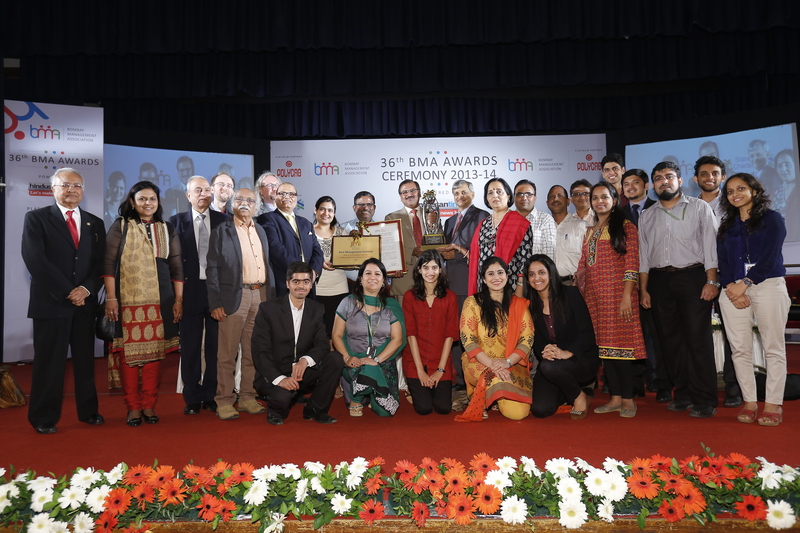 A lot has changed over the years, but BMA is committed to re-establish good management practices and we are really happy to present this award to WeSchool for their initiatives and projects that have empowered many students to realise their corporate as well as entrepreneurial dreams. We wish all the awardees great success and offer our continued support in their future endeavours”. The event began with a panel discussion on,’ India 2025 – Problems and solutions ‘ that brought to the table the collective wisdom of thought leaders like Smt Arundhati Bhattacharya,Shri Y C Deveshwar, Shri Uday Kotak , and Shri Sunil Kaushal,Regional CEO ,Standard Chartered Bank , with Shri R Ramakrishan,Vice Chairman and Joint MD,Polycab steering the debate in the right direction. 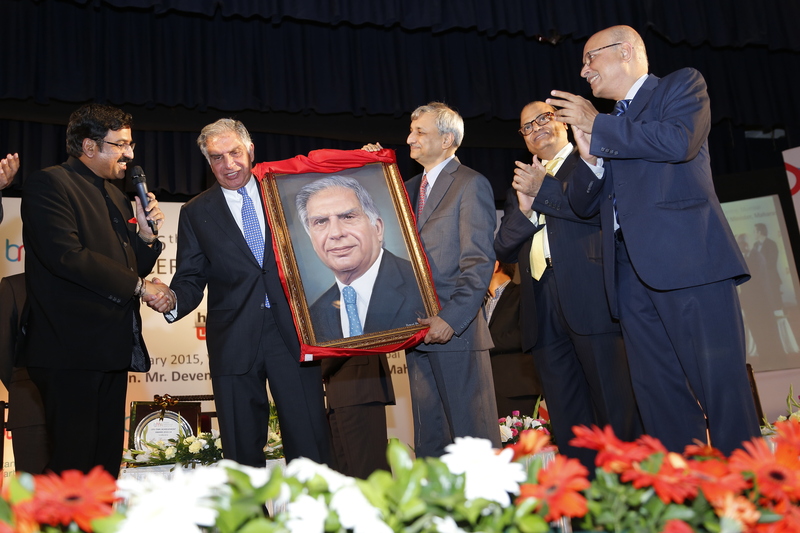 The star of the evening was clearly the legendary Ratan Tata, the recipient of the ‘ BMA Diamond jubilee Lifetime Achievement Award’ himself, was a picture of grace and dignity as he deftly took over the mantle of felicitating other awardees in the absence of CM Devendra Fadanavis. 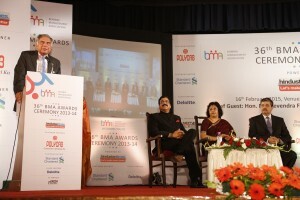 While applauding the efforts made by the BMA to recognize the immense contribution made by each awardees in not only in building businesses but also by investing in the future by aligning corporate objectives with social values, he had words of advice to give to the large number of young MBAs who hung on to every word of his in rapt attention. “This is new India, where your demographic group is not just a workforce but an intellectual asset. You need adrenalin in your system to go out and start a business. 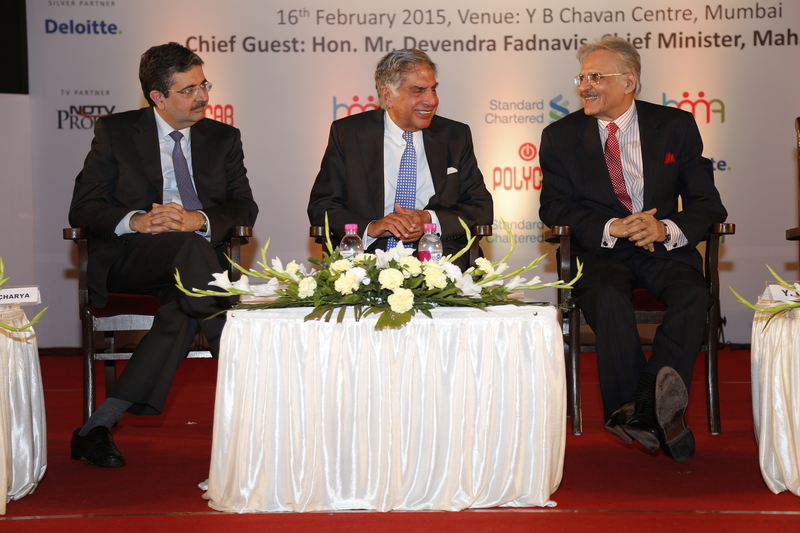 But as you become successful and grow, encourage the young enthusiasts to build India of tomorrow and the day after. All of you will make India the powerhouse that it desires to become.” Needless to mention that he got a thunderous ovation at the end of his address. As WeSchool received the honor at the hands of the doyen of Indian industry, Shri Ratan Tata, for its contribution to management education, Prof Dr Uday Salunkhe, Group Director, WeSchool said, “To meet the demand of futuristic glocal leaders who will lead India, WeSchool has always strived at creating an ecosystem for convergence of design thinking, technology and empathy, supported by our world class faculty; result oriented teaching techniques and experiential learning. Our aim is to mentor citizen leaders that are driven to work with passion and empathy and are instrumental in creating a win-win situation for all stakeholders in spite of a turbulent socio-economic environment. Let us join hands and take charge of the future “.